Thanksgiving dinner doesn’t have to be only rich, heavy foods. 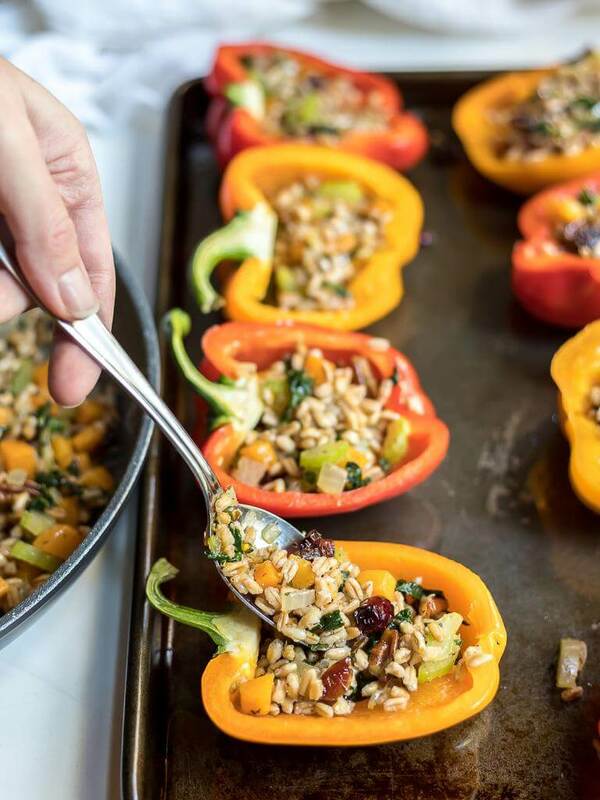 This Farro Salad Stuffed Peppers Recipe is full of Fall flavors, healthy and perfect for your holiday feasts. 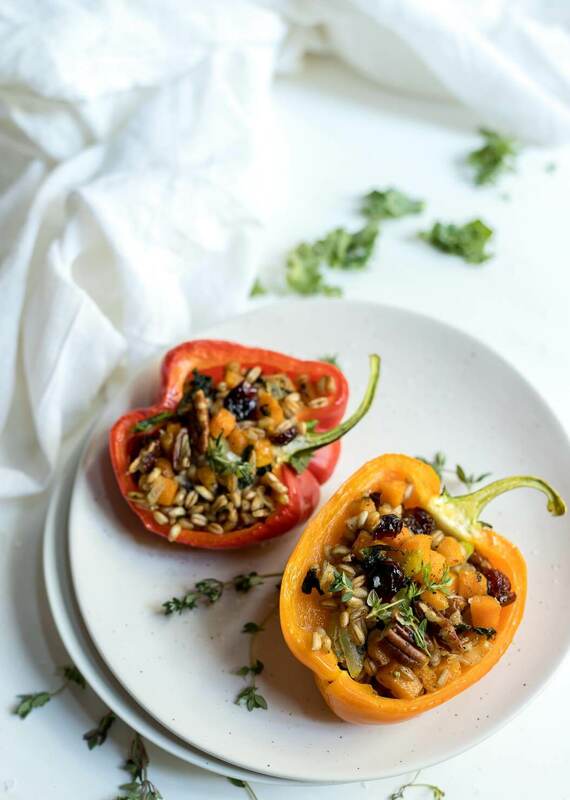 These peppers are stuffed with farro, butternut squash and kale to make individual servings of a stuffing style vegan side dish. This tasty recipe is sponsored by Thrive® Culinary Algae Oil. How do you make the best vegan stuffed peppers? We start with the best ingredients. Buy firm bell peppers, fresh kale and butternut squash. 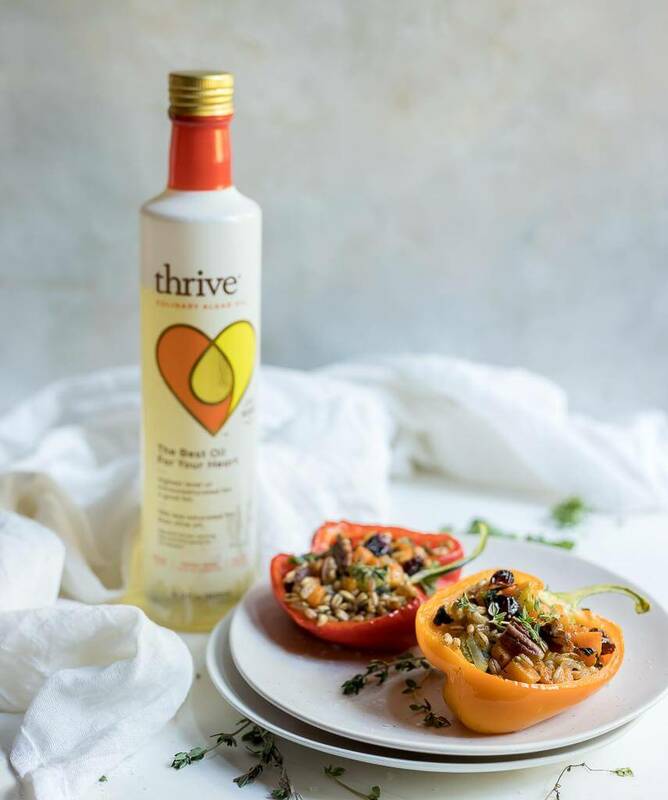 Throughout the preparation of this Farro Salad Stuffed Peppers Recipe, use Thrive Culinary Algae Oil to allow those fresh flavor to shine through. Thrive Culinary Algae Oil is great in any recipe because it is super versatile and has a neutral flavor. I use it in all sorts of recipes. 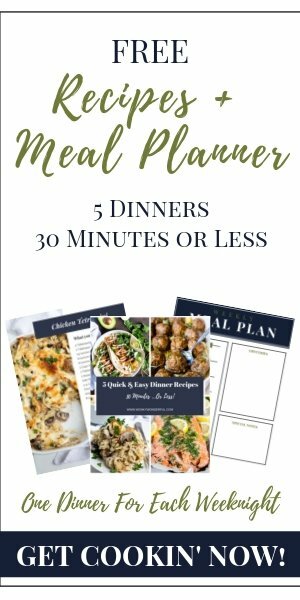 Here are some of my favorites: Roasted Spiced Fruit, Butternut Squash Pasta Salad, Easy Cheesy Twice Baked Potatoes, Crispy Roasted Chickpeas, French Onion Chicken Casserole, Zucchini Tater Tots, and Black Bean Burgers. Thrive Culinary Algae Oil works for all recipes because it has a super high smoke point (up to 485ºF) and an extremely neutral flavor. There’s no greasiness and no aftertaste like avocado and coconut oils can leave – just fresh veggie and fall flavors! Plus, Thrive has 75% less saturated fat than olive oil, and no other oil has a lower percentage of saturated fat. So it’s a better choice to help maintain heart health. Check the STORE LOCATOR to find Thrive Culinary Algae Oil near you. . . or purchase on Amazon. How long do you pre-cook the peppers? I cut down the time and effort by microwaving the peppers prior to baking. This also prevents the filling from drying out. 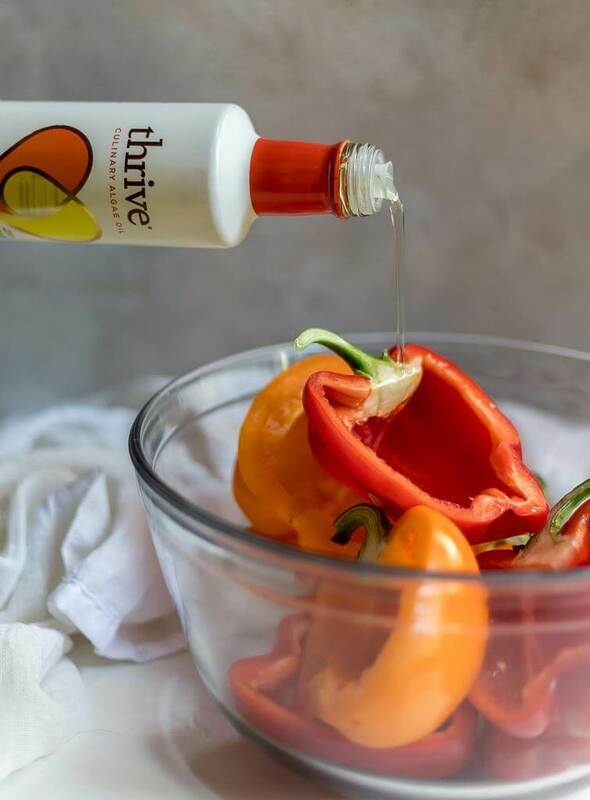 Just coat the peppers with Thrive Algae Oil and microwave for 6 minutes. This also allows most of the moisture to be drained off the peppers before baking. Nobody wants soggy stuffed peppers. This Butternut Squash and Kale Farro Salad tastes fantastic on its own. Using it as a filling for stuffed peppers is great for the holidays because it creates individual servings. In fact, you can use red and green bell peppers for a fun and festive Thanksgiving or Christmas side dish. 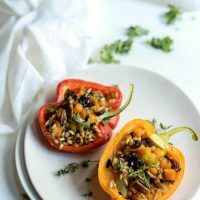 The colors and flavors in this Farro Salad Stuffed Peppers Recipe is unmistakably Fall/Winter themed. The peppers can be cut and eaten with the salad. Or, eat the salad then the pepper. These stuffed peppers are vegan and dairy free. If that is not a concern, these would be great served with some crumbled gorgonzola or goat cheese on top. Thanksgiving dinner doesn't have to be only rich, heavy foods. 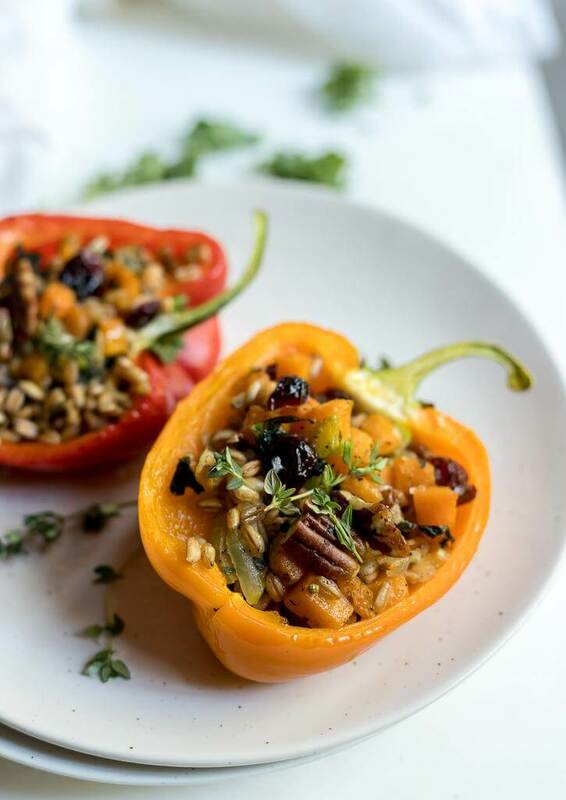 This Farro Salad Stuffed Peppers Recipe is full of Fall flavors, healthy and perfect for your holiday feasts - putting a lighter, vegan twist on typical turkey day stuffing. 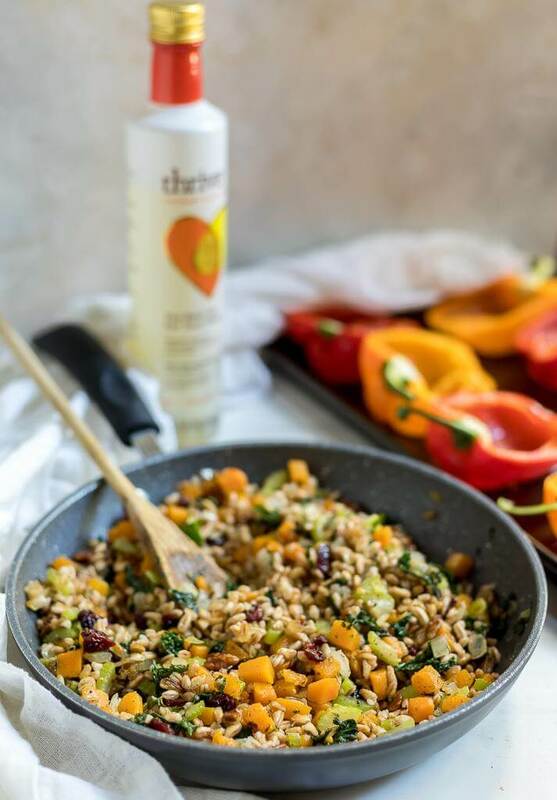 These peppers are stuffed with farro, butternut squash and kale to make individual servings of a stuffing type vegan side dish. Slice peppers in half, lengthwise. Remove seeds and veins. Transfer to large glass bowl. Coat with oil and lightly salt. Microwave peppers for 6 minutes. Drain any liquid or oil inside peppers and transfer to a greased rimmed baking sheet. Heat 2-3 Tablespoons oil in large skillet over medium/high heat. Add butternut squash, celery,onion and kale. Saute for about 5 minutes or until squash is browned and onion is translucent. Spoon filling into prepared bell peppers. Bake for 10-15 minutes. Top each pepper with a fresh thyme sprig and serve.